Amazing look and natural feel! The way your watch was intended to look, but with maximum protection! 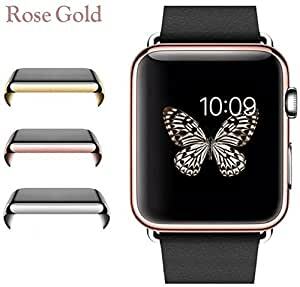 Josi Minea protective cover case will pay for itself as your first line of defense from scratches that will greatly reduce the resale value of your Apple watch! No detail has been overlooked with this premium product, and if you only accept the best for your phone, then look no further! Josi Minea cases offer best protection from drops & scratches, have beatiful design and are lightweight & sturdy. Our case is made of durable materials for a secure fit that exhibits the watch’s true colors. It measures 0.5mm in thickness, adding only a negligible amount of weight. Wristbands can be easily swapped with this case on, making it the obvious choice in protection that’s practical and convenient. – Amazing look and natural feel. Protect against scratches, dust & shocks.